Why didn’t you use Scion? I seem to get this question quite a lot, so I think it might be a good idea to address it globally instead of on a per individual basis like I’ve been doing up till now. for those who don’t know Scion it is a service that provides common functionality that editors for Haskell might need. It’s a wrapper around the GHC-API and provides a much more simplified interface to it all than the ghc-api. It implements a state for things like caching etc and works in the form of a out of process server (it runs as a separate process). It’s mode of communication with the outside world is Serialization. Now Visual Haskell (the original ones) were written using H/Direct and FFI to communicate via a COM bridge with Visual Studio. When I first thought of this project I was planning on “just” updating the original code to the new COM interfaces of Visual Studio (2008) 2010 while also updating the GHC from the 6.6/6.8 used to 6.10/6.12 . However there were a couple of problems with this, First off it relied on internal GHC structures which have changed a lot in time and some even completely removed (the changelog mentions “this seems to not be used by anything”). The second major problem was that Visual Studio itself evolved rather rapidly and the new interfaces were quite different. (If you want to use the new features). So I decided to rewrite it all. Start from scratch with the aim to rely less on the compiler internals but more on the interfaces it provides. I used the original paper on Visual Haskell to get started on this, In their approach they used Marshalling to read/write information directly from and to Haskell land, so I took the same route. At this point I did not know about Scion at all, and even If I did, I would have been following the route the original authors made with marshalling since I can directly pass the result of the call to visual studio by making sure the datatypes visual studio want be generated from the Haskell code. So therein lies the first problem, Scion uses XML serialization (afaik) and I wanted Marshalling. 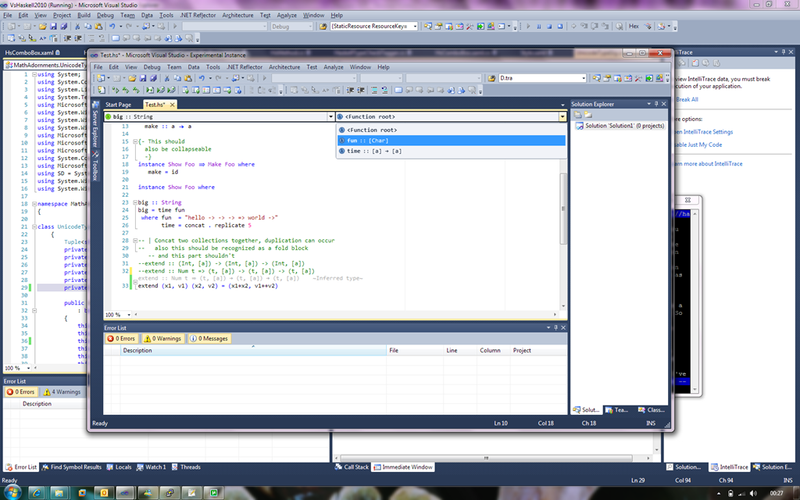 The second problem was that the datatypes I have were tailored specifically to visual studio. Eventually I decided to drop using the COM interfaces and moved to the managed interface using C#. Because C# can handle unsafe code I didn’t have to change anything (even though I eventually did). Then comes that whenever I add new features (while some overlap with Scion). I generate specific datatypes that I need, and that I don’t know if they would be useful to the rest of the world, hence that’s my reason for not “expanding” Scion to my needs. It needs to stay generic afteral. EclipseFP uses Scion, the Haskell IDE library. See http://code.google.com/p/scion-lib/ for more information. Which means that EclipseFP also uses a modified version of Scion. (which wasn’t merged back presumably for the same reasons I’m hesitant to change it). Also when I took a look at Scion later on, I noticed that it really had one contributor, (nominolo). Now nominolo has been pretty helpful in helping me out, he seems like a pretty busy guy. So at the time I figured Scion wasn’t an active project (at least not very active). And I was not in the mood to have to contribute to another project (I already have enough as is). The last commit was somewhere in mid 2009, and it seems to have been just minor tweaks and bug fixes in 2009. And Finally the last argument is that I wanted to learn about GHC as well. Having to write all this was a great way to learn how it does things, and that alone I think is a big enough reason for why I have not used Scion. It was also a lot of fun running into problems and having to find fixes for it. This post was not meant to be arrogant or condescending in anyway, who knows, I might back peddle one day and switch to Scion. But at this point it’s very difficult. But in order to foster the community effort behind it, I might one day commit the stuff in Visual Haskell that make sense back into Scion. As most of you who have been following this blog know I have IntelliSense and Cabal support left. I decided to focus on IntelliSense first (even though Cabal support is easier). So this is the first in a series of posts on how I’ve decided to implement IntelliSense. Function scopes: e.g. whenever you’re inside a function, you’ll get a list of every bindings (both local and global) ,lambda variables and Modules in scope. Should you type a module name and a . you’ll get the other module names you can choose or functions you can use qualified from that module if any. Type scopes: e.g. whenever you’re working inside a type signature, the list will limit itself to types that are currently in scope (along with modules again of course). This is how I plan to implement code completion, If anyone has any requests of suggestions please let me know now since I can still change it for the initial release now. In order to implement IntelliSense I need to index all the packages currently installed by GHC and also keep updating this as time goes by and you install new cabal packages. Visual Haskell will ship with a custom version of cabal-install ghc-pkg (and eventually a custom haddock as well in order to generate Visual Studio help files) so keeping them up to date should not be a problem. I have still not decided how to store this information, But I’m leaning towards a structure with a Spatial Index , more specifically I’m leaning towards using a BANG file. 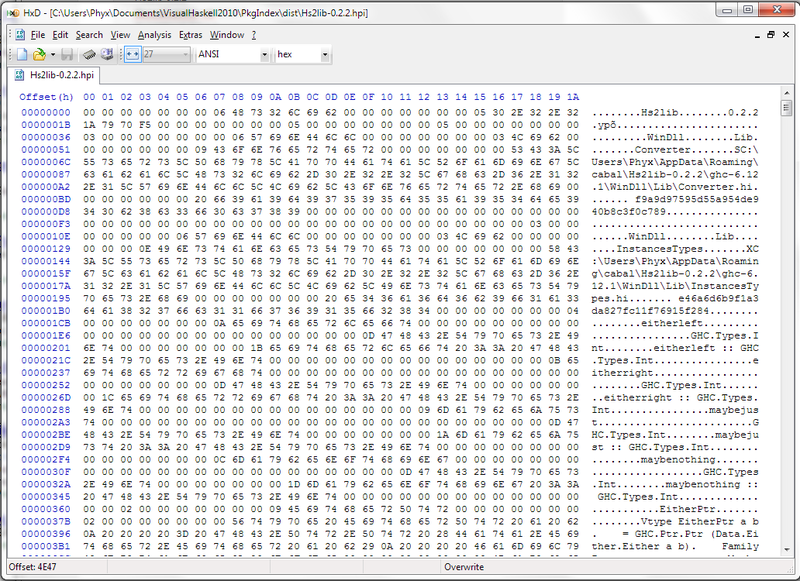 I believe using this file will allow me to do the different kinds of lookups I need to do while having a memory mapped file. For the class browser we want to be able to browse packages (in a simplified manner) so these files will contain all we need for now, along with the location of the actual .hi file if we need it for more complex stuff later. Candy is a feature where you replace a selection of text with something else (usually also text), however this is done in view only and so not in the actual file. This is useful to replace things like “->” with an actual Unicode arrow while still allowing other text editors that can’t handle Unicode to display the file correctly. Leksah implements this and allows you to configure it via a so called “Candy” file, So I “borrowed” their approach and extended it to suit my needs. the modifiers are self explanatory but the FIT or NONE modifiers take some explaining. When using the FIT modifier, the Candy engine won’t try to keep the same width as the text it’s replacing. This means that you get a layout change. The actual file might have “alpha” but the view will show only “a”. With some things, especially with keywords we don’t want this, this is where the NONE modifier comes in. When this is used the engine will always match the width of the text it’s replacing by making the Unicode text larger and adding horizontal whitespace. This means that “alpha” would be rendered as “ a “ and so preserving the layout. — space as the tokens it’s replacing. e.g. "alpha" will be replaced by " a "
This is just an intermediate update, showing the near final UI. Cabal support is what I’m working on now and that is about 20% finished. I hope to get that done in a week or so barring any more difficulties. If I do get cabal support I can put out a beta (without intellisense) just so I can get some feedback. Pardon the background noise, I’m currently in a lot of wind. Added a screenshot for good measure, Click on the image for fullscreen. This last week I’ve been busy with a lot of bug fixes, stability enhancements and finishing half implemented features. One of the big problems that I had was that the function which, for all intended purposes is the core of Visual Haskell, the module discovery code was very very slow. On average it ran in 1.2secs and a stdDev of 0.1sec. This might not seem all that bad at first glance, but consider this, every 500ms after your last key press, a call is made to this function to validate your changes. If the file had errors this would show up right away and you would be informed of type errors etc immediately, but when type checking actually succeeds, getting all the information we desire from a module takes a 1.2seconds on average as stated above. To the user this would total a 1.7second delay for any changes (at least for the average Haskell file). This is absolutely too slow, as features get added, it’s increasingly important to get this part right. My first thought was to optimize my use of Lists. I made changes so that cons is used as much as possible instead of the concatenation operator ++ , since cons runs in constant time. This shaved off about 0.1seconds on average. which Is not bad, but still not what I was hoping to gain. So the second thought was that the lists themselves was slow. I assumed this to be a reasonable explanation since a lot of list operations took place. My second change was to add strictness annotation to the datatypes (they’re being send over FFI anyway, so they’ll always be evaluated at one point, might as well do it sooner rather than later) and changed from Lists to a Vector from the "vector” package on Hackage. Unfortunately the change to Vectors has the opposite effect of what I wanted, (yes I did enable optimizations). Execution time now became on average 1.8secs and StdDev 0.3secs. Clearly not the right direction. But getModInfo now takes up 14.3% of the execution time, but the rest of time is still largely spend in the ghc api. 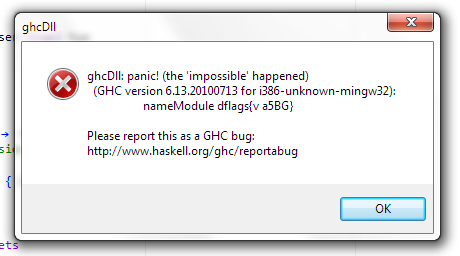 On every call GHC has to load the module and any interfaces for any imports that module uses. This is the slowest part, which is also I/O bound. So what if we can prevent this. Session information is stored in a type called HscEnv , this can be read and set using the methods setSession and getSession respectively. By restoring this session every time we can prevent GHC from reloading things it doesn’t need to. Since we already know that in between calls only the head modules could have changed we can safely do this. 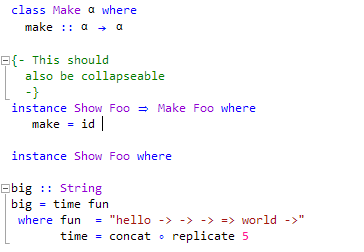 This is where StablePtr comes in (thanks to lispy from #Haskell for the suggestion), it offers us an opaque reference to a Haskell value and since it has a Storable instance I can pass it to and from C#. The ideal solution. There was only one problem, the api for StablePtr provided no mechanism to update, but there was one to dereference it. The solution is to store a mutable value inside the StablePtr then, in this case an IORef. This shows how we can pass a simple state (Env) around during different invocations. The idea is that, the calls to InitEnv, add, sum’ and freeEnv are done over FFI, which is why it’s important to have the value Storable and stable (as in the GC won’t touch it). The only thing left to do now is this call push- and pullSession in the getModInfo function to set and update the state. Having done so it was time to run benchmarking again. The results were impressive, a speedup of over 500%. This means that any one invocation should run in ~0.18s which should be pretty much unnoticeable to an end user. The added bonus is also less memory usage, since the biggest structure is pretty much reused. Because of the timestamps, even if other modules changed in between two calls, only the changed ones will get reloaded.